Ah! The Virginia star! The block of that state we currently call home, and the state that we are saying good-bye to for 2 months tomorrow!!! We will never be ready in time! The Virginia star is pretty basic as far as star blocks go, but I think it is quite pretty. When I was researching a state block for Virginia, I discovered there are quite a lot of variations of this block out there. I was inspired by this one at Scraps and Threadtales, with a square set on point in the center of the block. (1) 6.5 inch square. I cut the square at 6.5 inches and then trimmed the corners, but if you want, you could just cut a 4-7/8 square. (2) 4.25-inch squares, cut on the diagonal to make 4 triangles. These are larger than you need, but I prefer to cut a bit larger and then trim to size. (4) 3.5-inch squares of background fabric. This is important. All seam allowances are 1/4-inch. Do not be generous with your seam allowances. If you make your seam allowance too wide, you will get to the end and find that your block is smaller than the desired 12.5 inches. That would be a bummer. So, check your seam allowances with a ruler and make sure they are 1/4-inch, or just a hair smaller. ‘Tis easier to trim off a bit of extra fabric than to rip out a seam and start over. On the reverse side of the 6.5-inch square of fabric for the middle of the star, draw a line with chalk pencil or disappearing marker 1/4-inch to the inside of the square. This line represents the finished size of the center of the star. Find the mid-point of each side and draw a diagonal line to the mid-point of the adjacent side, forming the on point square that will be the center of the block. Trim off the corner 1/4 inch to the outside of the 4 diagonal lines you drew. With the right sides of the fabric together, line up the edge of one of those diagonal you just cut with the long side of one of the triangles of background fabric for the center of the star. Sew along the line you drew. Repeat for the opposite side and press pieces open. Line up the two remaining triangles with the two remaining exposed edges. 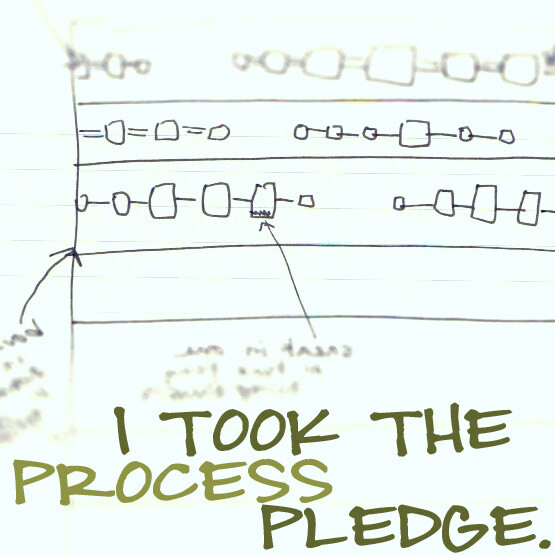 Sew along the diagonal lines you drew. Press the pieces open and trim your center piece to 6.5-inches square. Now to make the flying geese. When making four geese for a star block such as this, I prefer to use the “magic method” I learned in the Skill Builder Sampler. With right sides of fabric together, lay out (2) of the squares of fabric you will be using for the star points with opposite corners of the 7.25-inch square of background fabric for the center of the flying geese. Draw a diagonal line from corner to corner. You can put a pin in each square if you want, but I just held them in place. Sew a line of stitches 1/4-inch on each side of the line you drew. Cut the square apart on the line. Iron the smaller triangles to the side. I like to just lift the tip with my iron and press them out of the way. Line up one of the remaining square for the star points with the remaining exposed corners of the background square (now a triangle). Again, draw a line from corner to corner and sew a line of stitches 1/4-inch away from the line on each side. Cut the pieces apart on the line. Iron the remaining triangle open and trim the 4 geese to 3.5 x 6.5 inches. 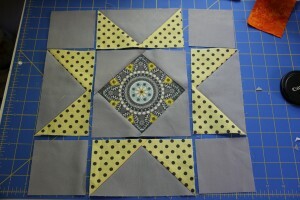 Lay out your block using the center piece, the flying geese you just made and the 4 corner blocks. Sew the rows together and then put the block together. Caution: Because of the extra square in the center, the seams at those points where the on point square meets the flying geese are rather bulky. Just go slowly and it will work out! Hey look! Remember how I said those seams were a little bulky? Yep, my block doesn’t lay quilt flat. That’s okay. I’m sure you won’t even notice in the finished product. Also, my points don’t line up perfectly. I don’t really mind. I LOVE how this block turned out. So, are you going to try this block? I hope you do! Go post yours in the Road Trip Quilt Along Flickr Group! The journey continues next week as we head to Maryland. 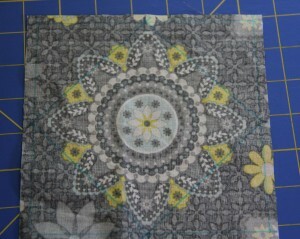 If you have freezer paper, we’re going to use it to make a template for a tiny paper pieced portion of the block. We only need a 3-inch square, so if you don’t have it, we’ll just use regular paper and pin it to the fabric. Great tutorial Em….I will def. get this together before you post the next one. Great tutorial! 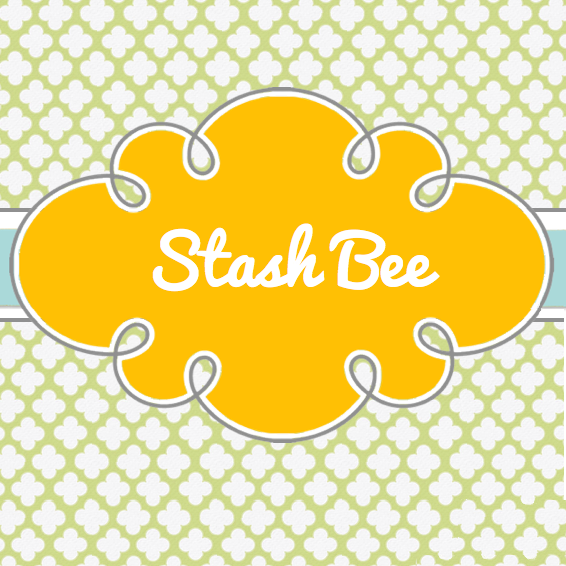 I am so excited to join my first QAL. I’m off to pick out fabrics! Your block looks great to me. I will be working on mine this weekend.